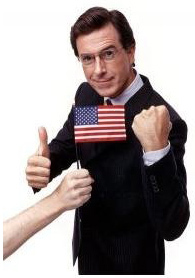 "1,000,000 Strong For Stephen T Colbert" may be the fastest-growing Facebook group of all time. Late in January, just before Barack Obama formally joined the presidential race, a few of the senator's enterprising fans created a hopeful group on Facebook: "One Million Strong for Barack." Nine months later, the group has attracted 384,780 members. In not quite the same vein, in February, clever critics of Hillary Clinton created a Facebook group called "Stop Hillary Clinton: (One Million Strong AGAINST Hillary)," which appealed to Democrats, Republicans and independents to "unite behind a single cause -- ensuring Hillary Clinton is not elected President of the United States." A bit more than 500,000 people have joined so far. Shortly after Stephen Colbert announced that he would be running for president in South Carolina -- that is, just last week -- Raj Vachhani, a high school student in Montgomery, Ala., created a Facebook group called "1,000,000 Strong For Stephen T Colbert." And unlike the Obama and anti-Hillary organizations, the Colbert group's name tells the truth: On Thursday night, the millionth member joined. Right now, 1,021,588 Facebookers support Colbert. There are no official stats, but as far as anyone can tell, this is the fastest-growing Facebook group of all time. But hark! Off in the distance I hear an angry mob screaming at me for not mentioning Republican Rep. Ron Paul. The Paul kids are notoriously tech-savvy, and they drive Republicans on the Web nuts. Just the other day, RedState.com -- where Paul supporters are called Paultards, MoRons, Ronulans, and, most damning, liberals -- announced that it is prohibiting all new registrants to the site from saying anything positive about Paul. "If your account is less than 6 months old ... you cannot pimp Ron Paul," site admins declared. Later they amended the policy: "You may shill for Ron Paul, with one condition: you must do it using the form of Japanese poetry known as Haiku." But on Facebook, the Rondelles -- my coinage -- are a pitiful force. Neither "One Million Strong for Ron Paul" nor "1,000,000 Strong for Ron Paul for President" cracks 500 members. One more thing on Colbert: If he's serious about entering the race -- and as Politico reports, Comedy Central has contacted an election-law firm to sort out of the legal implications of a TV personality running for president, so he may be -- his Facebook prowess is only one sign of his strength. Earlier this week Rasmussen ran a national survey asking how Colbert, running as an independent, would fare against the current front-runners. In a three way matchup -- Hillary Clinton (D) vs. Rudy Giuliani (R) vs. Stephen Colbert (I) -- Clinton gets 45 percent, Giuliani gets 35 percent, and Colbert gets 13 percent. Colbert, Rasmussen noted, attracts more young people than either Giuliani or Fred Thompson.